The town of Churchill (population 1,000) is a northern Manitoba community accessible only by air and rail. A true bucket-list vacation destination, this rugged outpost on the edge of the Hudson Bay offers experiences you won't find anywhere else in the world. Polar bears and beluga whales are just two of the main attractions that bring hundreds of international visitors to Churchill every year. The town is also famous for its nightlife, as one of the world's premiere viewing destinations for the aurora borealis (northern lights) that dance in the sky some 300 nights each year. From the landlocked wreck of the Ithaca, to the enormous Sea Walls murals, to helicopter tours over the remote northern wilderness, there's no end to the surprises you'll find on the edge of the Arctic. 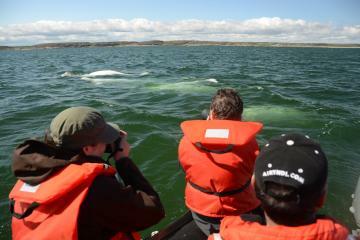 In the summer, white beluga whales surface and plunge in the blue-green waters of the Churchill River. You'll be within talking distance of the most vocal whales in the world. 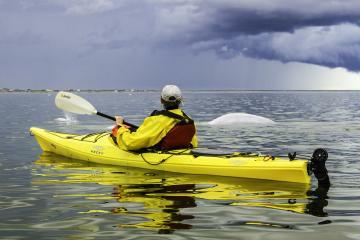 More than 3,000 beluga whales come in early July to feed and calve. Seals can also be seen in the harbour and caribou are frequently sighted along the coast, and polar bears laze in the purple fireweed. Churchill is also a birdwatchers' paradise-some 250 species of birds including the rare Ross Gull, nest or pass through on their yearly migrations. In the fall, you can see why Churchill is known as the "Polar Bear Capital of the World" as hundreds of bears pass through and around the town on their way out to the freezing Hudson Bay ice. You can watch the bears from the comfort of a heated tundra vehicle, or get up close and personal with the arctic landscape with a walking excursion on the bears' turf. No matter how you do it, a winter northern safari is a once-in-a-lifetime experience. You can see the aurora borealis (northern lights) all year round when they make an appearance in the northern night sky. Blue, green and white in colour, they enchant visitors on clear nights in a performance worth waking up for. According to legend, the northern lights will dance their way down to earth if you whistle at them. Why not give it a try? Browse these unique Churchill experiences and more below.